Welcome to our very first sketch of July! Let's embrace a new month of creativity. Below you'll find Sketch 288. Create cards, scrapbook layouts, home decor, treat containers, mixed media, etc. using this week's sketch and be sure to link your project below for a chance at the weekly My Favorite Things Gift Voucher worth up to $20. 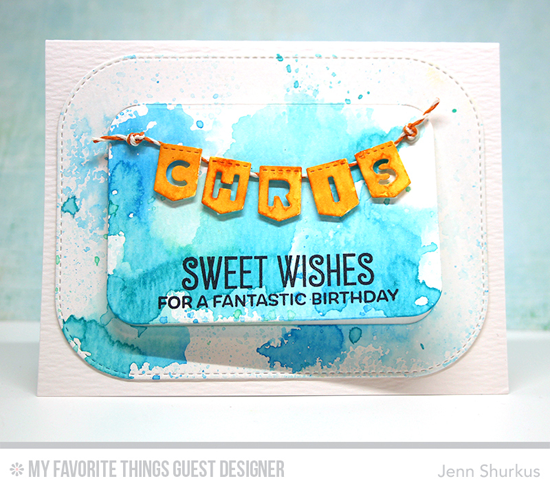 Join me in welcoming Jenn Shurkus as our Guest Designer this month! 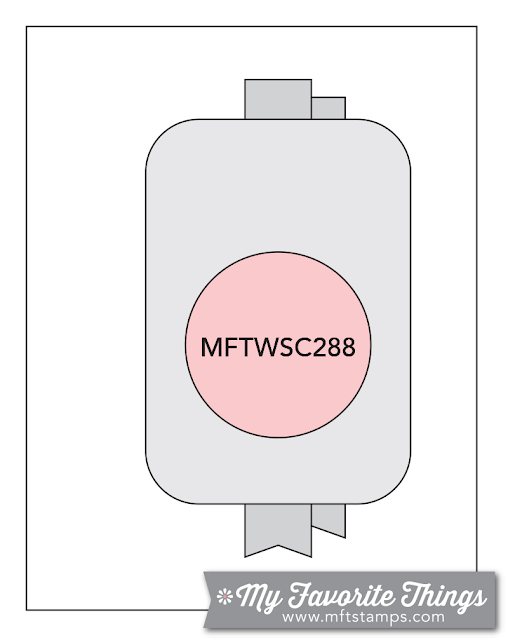 The rounded rectangle of the sketch prompted Jenn to pull out the brand new Blueprints 30 Die-namics. Instead of the flags in the sketch, she incorporated the Stitched Banner Alphabet Die-namics to create a personalized banner for her card. 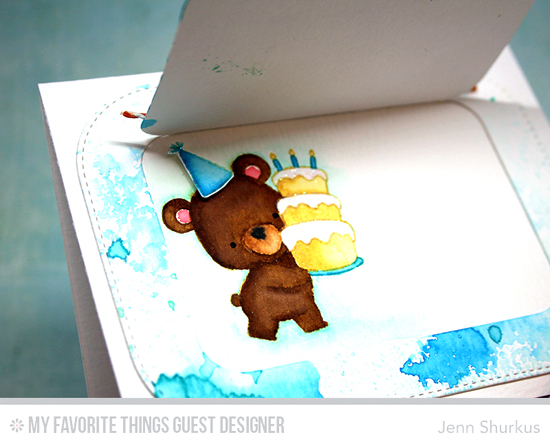 And inside the fun flap is a little surprise with the new Beary Special Birthday stamp set and Die-namics! The My Favorite Things Creative Team has been busy getting creative! Let's see what they have up their sleeves for Sketch 288! Anna follows the sketch closely with the rounded rectangle, the circle, and the flags. What a pretty use of the leaves from the Flashy Florals stamp set, and the Gingham Background stamp creates a subtle and beautiful card base. Barbara had lots of fun creating a cute and funky tag on her stitched rounded rectangle. I love her use of the Concentric Circle Grid stencil to give an illusion of a circle on the tag mimicking the circle of the sketch. 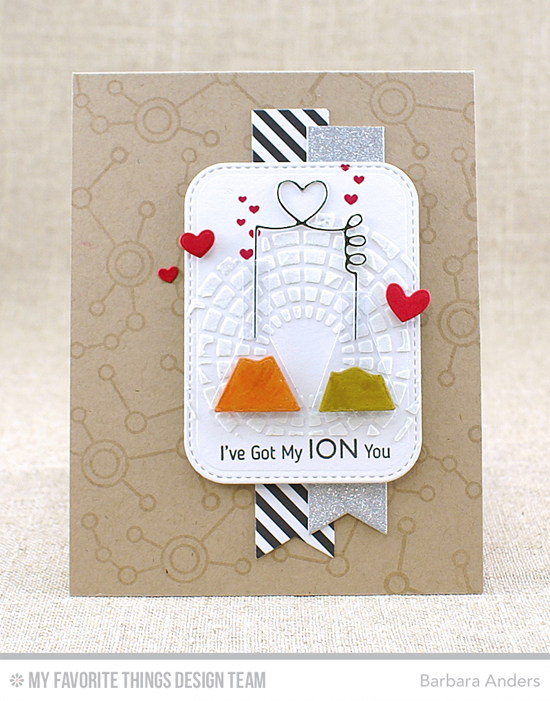 The tone on tone stamping on the card base is a perfect complement to the entire design. 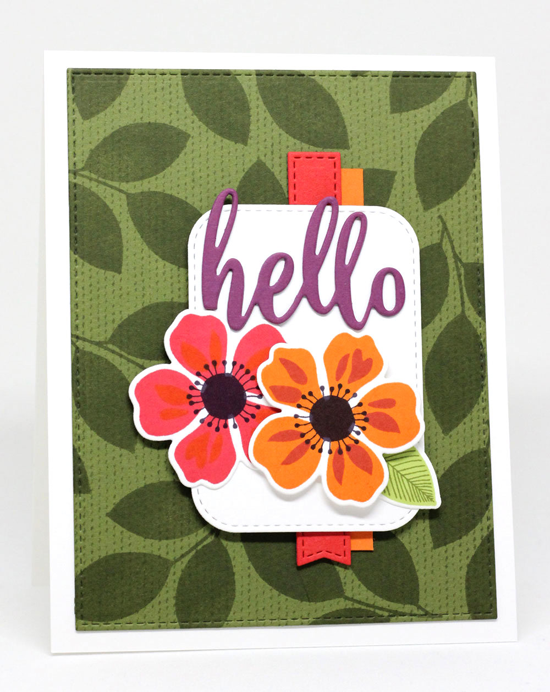 Jody's saturated design shows off jewel tones and the Flashy Florals stamp set and Die-namics. 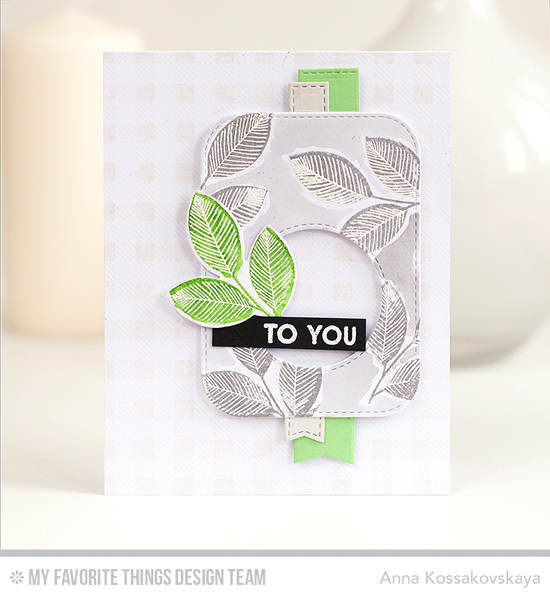 The layering she's done with the leaves from the set and the Scattered Surface Background stamp is awfully inspiring! Amy's summery design is quite inventive! She begins with a wave-like background created with the Balloon Strings Background stamp, and then she creates a delightful shaker component comprised of a scalloped rectangle and a portion of the Dainty Scallop Cover-Up Die-namics. WAY fun. Debbie takes the sketch the masculine route with the Get Down to Business stamp set and Die-namics, the Geometric Grid stencil, and her color choices. If you're looking for inspiration for cards for the men in your life, this one is chock full of great ideas! 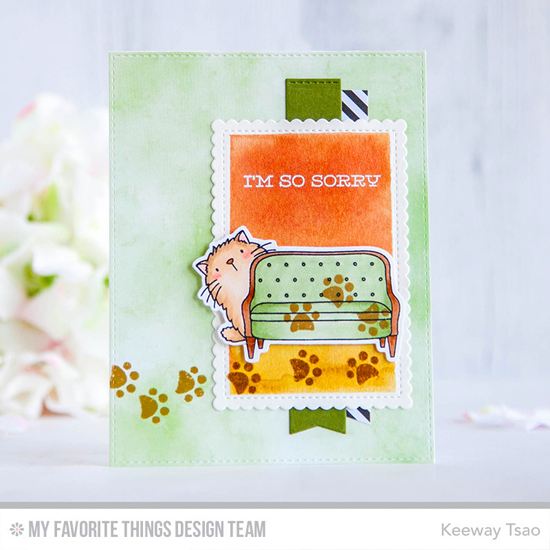 Keeway creates the sweetest little scene on the rectangle portion of the sketch combining the Cool Cat and Make Yourself at Home stamp sets. 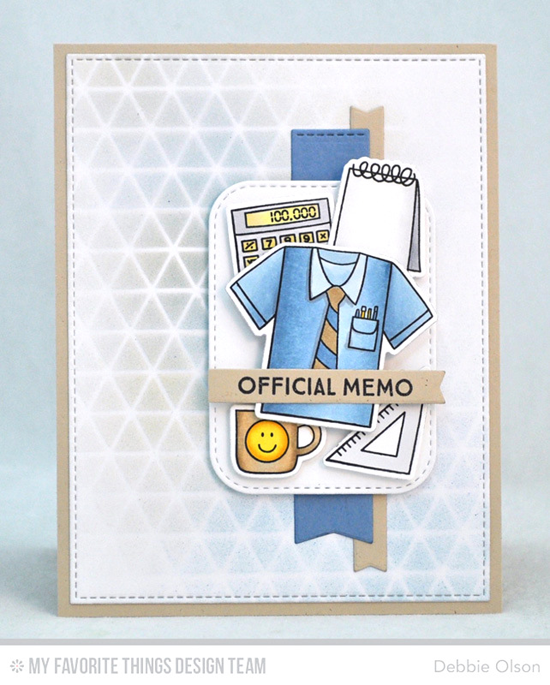 The scalloped rectangle takes this design to total adorability! Congratulations, Karli! You are the randomly selected winner of last week’s sketch challenge. You can view all the entries for last week’s challenge HERE. You have until Tuesday, July 12th, at noon EDT to add your link and be eligible for the prize of up to $20 in MFT Cash to be spent in the MFT boutique. Winners are chosen at random, so everyone has a chance! 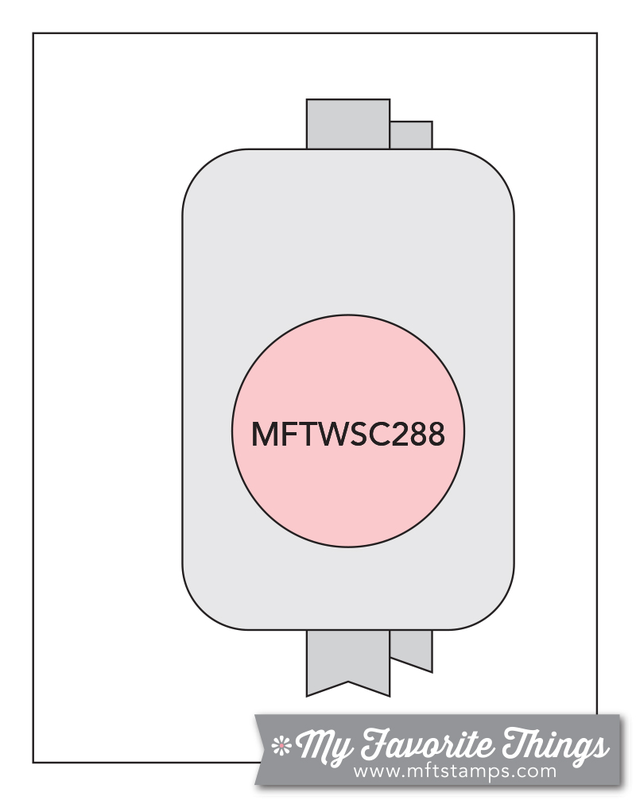 The weekly prize is a $15 Gift Voucher to My Favorite Things, but if you use MFT stamps and/or dies in your project, you’ll receive an extra $5. Fabulous work behind the DT, as usual! So glad to have Jenn, too! I love her work. So much inspiration. I'm laughing about the dirty kitty prints and in awe of the pool party feel of Amy's card! Delightfulness and adorability in bulk this week!! 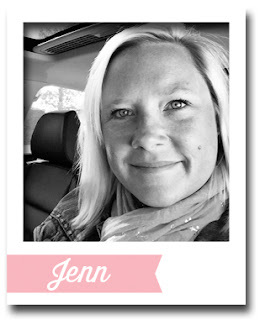 :) Jenn's fun hidden gem is cute!! :) looking forward to more! So cute! Thanks for the fun challenge!